Low-to-Moderate income families in Genesee County can file their taxes for free with an IRS-certified volunteer through United Way's Volunteer Income Tax Assistance (VITA) program. VITA is a volunteer run program in partnership with the IRS to help families access the EITC and other credits that can boost financial stability. The schedule below list sites and times for walk-in and appointment tax preparation. Before you go, make sure to review this list of items to bring with you to assure your tax preparer can complete your return. Shiawassee County taxpayers with 2018 income of $55,000 or less can have their federal, state and city (if applicable) taxes prepared and filed for free at the Vernon Public Library this year through the Scan and Go Volunteer Income Tax Assistance Program (VITA). To schedule an appointment, call the library at: 989.288.6486. For the 2016 tax year, we had 5 tax sites operating with 68 volunteers. Here is a snapshot of the work completed at our sites this past tax season. For the 2016 tax year, we had 5 tax sites operating with 68 volunteers. Here is a snapshot of the work completed at our sites this past tax season. With tax season just around the corner, we are looking for volunteers to assist local residents with completing their 2018 tax returns. 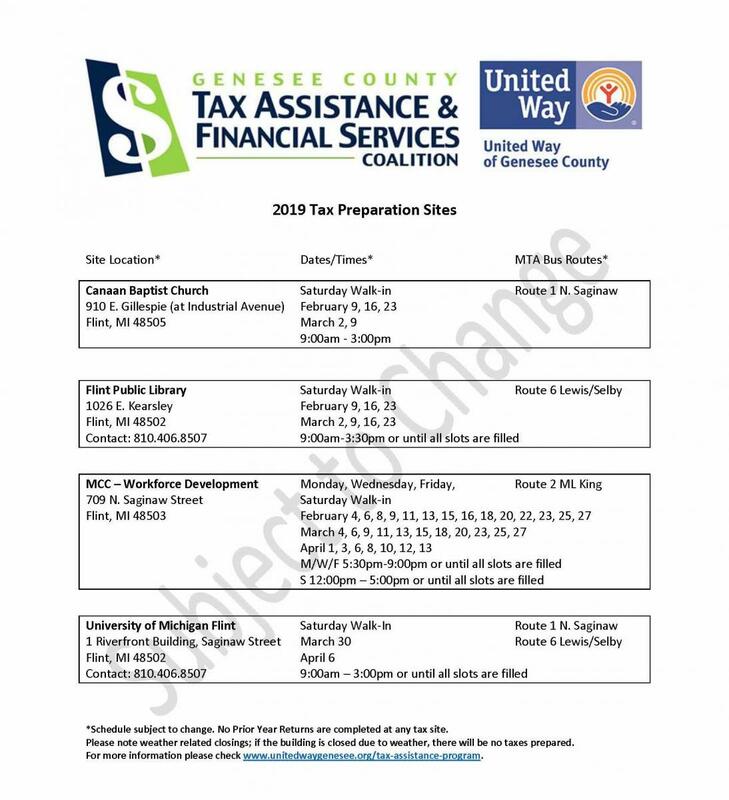 If you are interested in learning how to complete federal and state tax returns and volunteering to help in your community, please contact Mary Bishop at mbishop@unitedwaygenesee.og.